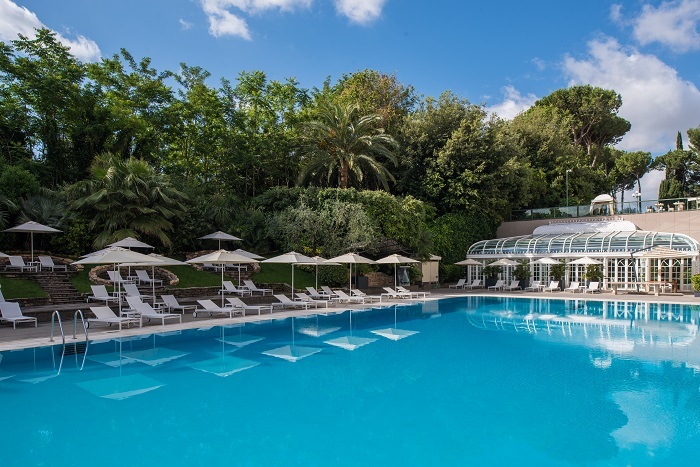 Hidden like a gilded secret in the forest, the Rome Cavalieri, A Waldorf Astoria Resort, is the place to catch a glimpse of Italian high society. Arriving for a two-night stay earlier this month, the hotel is in full flow. An elegant wedding sees dozens of sharp, black-suited men fill the lobby in an exhibition of Italian style, while the bride ghosts past in a plume of exquisite perfume. A firework display later in the evening will bookend the celebration, with all present invited to join the party in the lush 15-acre private Mediterranean park that surrounds the property. As guests of the exclusive Imperial Club we are whisked to one side for a private check-in, with sparkling wine helping to melt away memories of the journey. Before heading upstairs there is just a moment to take in the lobby, one of the most attractive areas of the Rome Cavalieri. Home to some of the private collection of paintings, tapestries, period furniture, statues and artefacts that are a theme of the property, the space has the feel of a lively museum. 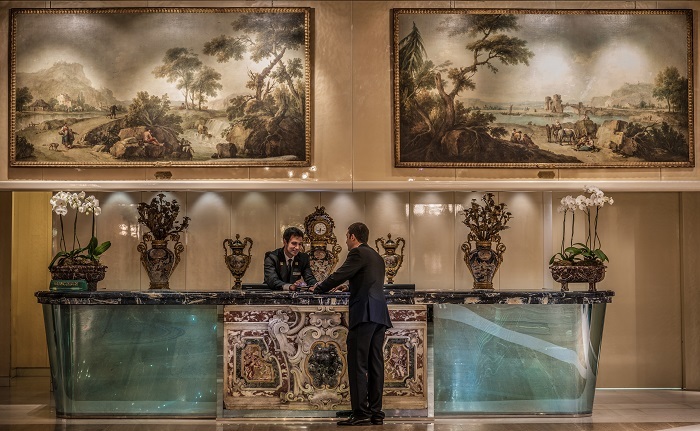 To one side, three of Giovanni Battista Tiepolo’s most important masterpieces take pride of place, while there are countless other objects from the private collection of the hotel’s owners. Upstairs, in the top end suites, walls are decorated with unique pieces of artwork and furnishings, including original Karl Lagerfeld sofas, rare 18th century antiques, and Andy Warhol and Robert Indiana paintings. Even the landings on each floor are home to exquisite antique clocks – though each tells a different time – while visitors are also urged to keep their eyes peeled for costumes worn by legendary ballet dancer, Rudolf Nureyev. Shown to our room, it is the views over the city that are the real star here. 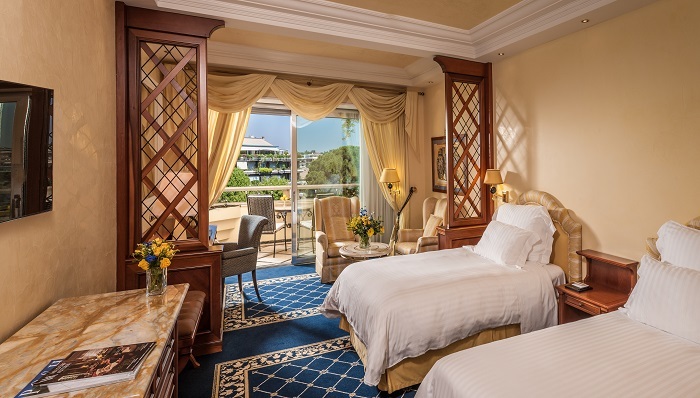 Perched atop Monte Mario, Rome Cavalieri is at once part of the Italian capital and, at the same time, completely aloof. Guests can use the hotel as a retreat in its own right, spending days in splendid seclusion, or as a base to explore one of the most important historic cities in Europe. At 50 m², our Imperial room is spacious, with royal blue carpeting, feather-soft bed, and a comfortable seating area. Colour coordinated flowers sit on the desk while, in an unusual flourish, a large, mirrored sound-proof door swings shut to seal the room completely from the outside world. A special mention, too, for the Salvatore Ferragamo toiletries – including lip balm, under-eye cream, and a facial mist – branded by my travelling companion as the best she has ever seen. Outside there is a large balcony with views over Rome and the resort, while below a pride of male lion statues stalks through the grass and parakeets dance through the surrounding trees. Rome Cavalieri last year completed renovations to its Petronius suite, making it one of the most luxurious in Rome. However, the historic nature of the property – which was originally planned as a hospital before opening as a hotel in 1963 – means the renovations could not alter too much. As general manager Alessandro Cabella told Breaking Travel News last year: “The hotel is well known for housing the largest private European art collection, with more than 1,000 pieces of art displayed around the property. “We are unique for this and it does not allow us to change the character of the property too much. Rome Cavalieri also recently completed renovations of the exclusive Imperial Club. The newly decorated space boasts a fresh look with brand new décor including new carpeting, curtains and furniture. A refurbished buffet corner presents food and beverage displays aligned to monthly themes, offering guests a range of delightful dishes and cocktails throughout the day, from breakfast and light afternoon snacks to early evening hors d’oeuvres and after dinner drinks. Guests can also indulge in an artistically lavish afternoon tea, featuring an Imperial tea tasting, cakes and homemade gelato, and the extraordinary sight of celebrated ballet dancer Rudolf Nureyev’s bejewelled costumes on private display. A private balcony provides a unique vantage point above Rome, allowing guests to soak up breath-taking city views as they enjoy the amenities. During our time there, the lounge offered a welcoming family atmosphere, a world away from the stuffy club feel that can dominate these environments. Of course, a property of this nature would not be complete without a range of fine-dining options. On the top floor, La Pergola Restaurant & Bar means Rome Cavalieri is able to boast it is the only hotel in Italy to offer a Michelin-rated three-star restaurant. Under the direction of celebrated chef Heinz Beck, the restaurant is home to a €260 tasting menu - including rabbit tortellini, duck foie gras powder and oysters – served against panoramic views of the city. Downstairs, L’Uliveto sits by the outdoor pool. Hotel restaurants are notoriously quiet, but during our visit the place was filled with the sounds of laughing families, courting couples and celebrating groups. The location serves a full menu of Mediterranean and international dishes, while a live piano player creates an exuberant mood – a highlight of any visit. On the lower levels of the hotel, the Cavalieri Grand Spa Club is seen as the most luxurious facility of its kind in Rome. Spread over 2,500m² of pampering, relaxation and wellness space, it offers ten treatment rooms. Guests can indulge in a wide range of spa services, from La Prairie facials to Ayurvedic massages, as well as two saunas, a whirlpool and an amethyst Turkish bath. There are three outdoor swimming pools, as well as a glass-domed indoor pool, featuring a cascading waterfall, hydro-massage pool, Japanese stone walk and an impressive wood-burning fireplace. “Here you can relax like an emperor,” my guide says. A personal favourite was the 3.5-metre-deep Olympic-sized outdoor pool, where guests can relax in the dazzling sunshine. Here one can taste La Dolce Vita, with Rome Cavalieri home the best the Eternal City can offer. Rome Cavalieri is considered the World’s Leading Luxury City Resort by voters at the World Travel Awards. The property is part of the Waldorf Astoria Hotels & Resorts portfolio, a collection of nearly 30 iconic properties that create a unique sense of place with a relentless commitment to personal service and culinary expertise in landmark locations around the world. Unified by their inspirational environments and True Waldorf Service, Waldorf Astoria hotels deliver graceful service from the moment a guest books through checkout. Waldorf Astoria is a part of Hilton, a leading global hospitality company.